Sonny tells Libby that all she needs to do is say no. She kisses him, but looks troubled when he gets a bit heavier. Libby leaves Sonny and gets a taxi home. Karl is confused about Libby and Sonny's relationship. Linda tells Cheryl that she wants to marry Lou so she will inherit a large sum of money. Danni makes a huge fuss of her ex-boyfriend Michael and Mal is furiously jealous. Karl wants Susan to tell him all about Africa, but she goes to bed. Sonny appears in the darkness for an explanation off Libby. Angie and Sam discover that Annalise and Stonie have slept together. Annalise protests to Sam that it isn't how it looks. Without saying a word, Sam bolts through the door. STONIE: Now is not the right time to tell him about us. ANNALISE: Tell him?! I think he's worked it out, don't you?! Stonie tells her that she can't go after him dressed in a bed sheet anyway. Annalise rushes off, and Stonie insists that it's not the end of the world. Angie yells at Stonie, and he yells back. Angie is thoroughly ashamed of Stonie, but he turns his attention back to Annalise. He bangs repeatedly on the bedroom door, but Annalise refuses to let him in to talk. Sonny has got Libby into his van and tells her that he's not going to hurt her; he just wants to talk. Libby says she doesn't want to and asks him to let her out, but Sonny forcibly holds her in the van. Billy goes outside to see Cassie and spies Sonny's van. He realises Libby is probably in there and goes over to investigate. Libby is extremely upset. She reveals that Sonny came into the yard and dragged her into the van. Sonny reckons it was the only way he could get her to listen to him. Billy bangs on the van window and this infuriates Sonny further. He thinks this proves his point and as they can't talk here, he starts the engine and drives away. Libby is screaming Billy's name as he does so. Billy chases after the van and then sprints back to his house, yelling for Karl and Susan. Linda is explaining that they can just get the marriage annulled after they have the money. LINDA: It's like a little game, almost. A pretend marriage. CHERYL: Mmm hmm? A legally binding pretend marriage! LOU: Sweetheart, it wouldn't have to be for long. One year. Two at the most. Linda mentions that she knows they could do with the money, which infuriates Cheryl further. She says the $200k would come in handy for them, but Cheryl tells her that she and Lou have things to discuss in private. Jo reckons that Sam and Annalise are probably having a nice romantic dinner for two! 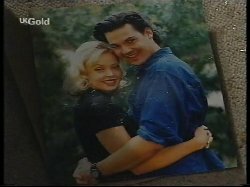 Sam bursts in from the bedroom and smashes a photo of him and Annalise. He leaves the house without explaining what's going on. Karl and Susan are looking for Sonny's address. Susan doesn't understand why Libby would be scared of Sonny, but Billy insists that she didn't want to be in the van with him. Billy reluctantly explains that he thinks Sonny expected Libby to sleep with him, and when she didn't, he lost it. KARL: He'll find out about losing it when I get my hands on him! Karl grabs his car keys and rushes off to find her. Susan tells him to stay calm, but it falls on deaf ears! Angie is unimpressed with Stonie - Annalise was practically a married woman. Stonie is unrepentant. STONIE: Anyway, it's probably a good thing it's out in the open now. ANGIE: YES! So now the whole town knows she's a cheat and you can't be trusted with your mates' girlfriends. Angie tells him that she's glad Kerry broke up with him, but Stonie confesses that she was just a friend and he used her to cover up his affection for Annalise. Angie is even more devastated that Stonie has been lying to her. ANGIE: (tearfully) I don't want to hear anything more out of you! You're as bad as your brothers! I had... such high hopes. I was so proud of you! Angie goes off, crying. Annalise walks in, now fully dressed. Stonie tries to talk to her, but Annalise tells him she doesn't want anything more to do with him. 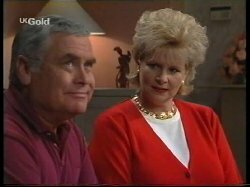 Lou concedes that the marriage plan was a stupid idea, but Cheryl doesn't think so - she's just upset that she wasn't included in the discussion. Cheryl wants to know about the plans - who has to know about all of this? She warns that whoever the money should go to if the marriage doesn't go ahead will be watching like a hawk - as will their legal team - so Lou won't be able to sign a piece of paper and keep living with Cheryl. Cheryl thinks that they've not thought it through at all. She suggests getting some specifics off Linda and they should discuss it all together. Mal enters, looking for Danni. He's still clearly shaken about her attention going to Michael, but as he's about to talk about it, Danni arrives home. Danni explains that she's been at Number 26 looking at photos of Michael's house in Marree. Mal is not impressed, but Danni is blown away. She tells them that Michael practically built it with his own hands, but Lou corrects her saying that Phil helped him! DANNI: Not the way Michael tells it. MAL: Oh, Michael, Michael, Michael! If I hear his name once more, I think I'll throw up! Danni tells him that they've discussed this issue already! She invites him to stay the night, but Mal isn't sure she wants him to. She reassures him and pushes him towards the stairs. Jo and Marlene are listening by the bedroom door. Jo wonders if he's ok but Marlene thinks it's best to leave him. Jo thinks she should go after Annalise and see what's gone on. Sam emerges with a bag full of Annalise's things and dumps it in the living room. Sam says she can pick it up when he's not around; he doesn't want her in the house. Jo is upset about Annalise being thrown out. 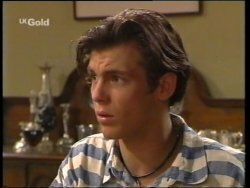 Sam suggests that as she's 'so hot for Rebecchi, she can go and live there.' Marlene pieces two and two together (she's quick, that one) - and is shocked. Billy and Susan are anxiously waiting for some news. Susan is confused as to how Sonny's personality could've changed so suddenly. Billy says that Sonny had put Billy offside with his dyslexia comments but everyone else thought he was Mr Wonderful - especially Mal. Susan doesn't think it's a great welcome home. Billy tells her she's been missed - everything falls apart when she's not around. Annalise walks in and Jo's upset. Sam comes storming out and Annalise tries to apologise to him. She reckons that she loves him, he loves her and they can get past this - but Sam tells her to get her stuff and to get out. Annalise sobs but Marlene blocks her way. She tells Annalise that Sam doesn't want her to stay, so she doesn't live there any more. Sonny has parked up outside his house. Libby refuses to go inside with him. SONNY: If I wanted to do anything to you, I could do it just as easily in here. LIBBY: Try and you'll see how loud I can scream. Sonny says he just wants to know where he stands with her (yeah, this is a sure fire way to win a confused girl over, pal! ), as she's running hot and cold with him. Sonny says he's used to people who know what they want and that by her saying that it's not the right time, what she really means is that he's not the right guy. Libby tells him that after his actions today, that might be what she means! Sonny asks her if she wants a physical relationship. Libby is unsure, and says that she doesn't want just a physical relationship, whereas she thinks that's all that's important to Sonny. He says they'll put the physical relationship on hold again, but Libby doesn't think she can trust him. Karl's car squeals up and Karl jumps out, and demands that Sonny get out of the van. Karl yanks the door open and grabs Sonny, after telling him that if he's laid a hand on Libby, he's going to be sorry. Jo and Annalise are in a hotel. Annalise is devastated and is trying to work out why she slept with Stonie. Jo tries to console Annalise, but Annalise just wants Sam back. Karl has got Sonny held up against his van. Sonny is protesting his innocence but Karl is furious. Karl tries to get the truth out of Libby, and explains what Billy told him. Karl leads Libby to the car so he can have a "word" with Sonny. Karl tells him that he and Libby are finished. Sonny is gutted. Karl and Libby arrive home. Susan is frantic, but Libby is angry. Karl says that Libby keeps telling him that nothing happened. Susan asks about Billy's story that Sonny attacked Libby on the beach. Libby reckons it's none of Billy's business. BILLY: Oh, ok. Next time someone kidnaps you I'll just...shut up about it! Libby says she wasn't kidnapped - Sonny just got worked up, but he knows she didn't appreciate it...end of story. KARL: You owe us an explanation. KARL: If that's what it takes to get to the truth; yes! Susan tries to stroke Libby's hair, but Libby storms off in a huff. Cheryl says she's not dismissing the marriage idea out of hand, but she's amazed at Lou's cavalier approach to it all. The two bicker at the breakfast table. Brett is playing with Lolly in the front room. Mal and Danni walk in arguing about Danni not repeating Year 12. MAL: It's one more year. What's that out of the rest of your life?! DANNI: Erm, 12 months, 52 weeks, 365 days! She thinks it's a lot; Mal thinks she's crazy for not going back. 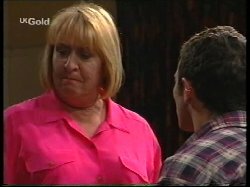 She asks Brett what Cheryl and Lou are arguing about and he tells her that Lou wants to get married again - but not to Cheryl, to his ex-wife. Danni and Mal are confused. Brett tells them it's complicated but if they want to know, they can go and listen to the argument and they'll soon get the drift! Danni marches in and announces that she's not repeating Year 12. Cheryl is aghast. CHERYL: So you're telling me you're throwing away the last six years of your life just like that?! DANNI: Noooo, I'm telling you I'm not going to throw away another one! Lou warns her to think about the decision carefully. CHERYL: If you don't mind, Louis, I'll handle this. You're hardly the man to be giving advice for thinking things over carefully! Everyone continues to argue heatedly. Brett picks up Lolly and wishes he could go back to Africa. The family are sitting at breakfast. Billy says at least they know what kind of a guy Sonny is now. LIBBY: Shut up, Billy. You don't know anything about it. KARL: None of us know anything about it. Mal walks in and wonders what's wrong. Susan explains that Libby and Sonny had a falling out. Karl says it's a bit stronger than that, but Mal's just upset because he needs his job with Sonny! MAL: Well, what happened anyway? KARL: That's what we'd all like to know. LIBBY: It's nobody else's business! MAL: It's all right, no sweat. I'll go down the surf shop this arvo and get it right from the horse's mouth! 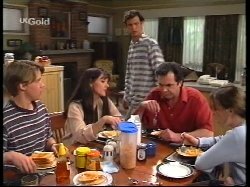 Libby looks at Mal in disgust and angrily gets up from the table. Susan and Billy look at him in shock. MAL: (confused) What? What did I do?! Libby is sitting with Cassie. Brett creeps into the garden and puts his hands over Libby's eyes. Libby turns around and starts hitting him in a panic. Brett is shocked and then Libby realises who it is. She tearfully hugs him tightly. Brett looks a bit befuddled by it all!